Fajerwerki Bydgoszcz - hurtownia - dystrybutor TRIPLEX, PIROMAX i in. Enjoy another year to buy. We are open hole year. During pyrotechnic period we have more than 400 assortment! Main polish importers JORGE, TRIPLEX, PIROMAX, TROPIC and SUREX fireworks available. 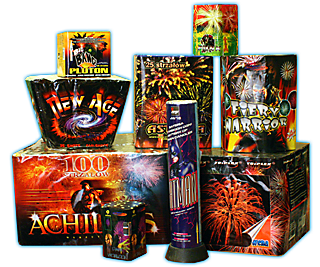 HANEV company is the largest distributor of fireworks in our northwest region. In our warehouse you can find fireworks of most reputable polish importers: JORGE. KOMETA, TRIPLEX, EURO PYRO, PIROMAX oraz TROPIC.